The special features of the 12AN Power Module makes it suitable for general use. The 12AN Power Module is for general use in acoustic measurements both in the laboratory and in the field. If you are looking for a cost-effective solution or a multi-channel power module with a direct coupling (no filters) to the output, the 12AN Power Module is a logical choice. The input signal is coupled to the output without any filtering or A-weighting network. Because of this, the 12AN Power Module is ideally suited for infra-sound measurements. The low-frequency cut-off at 0.05 Hz is so low that it will not be the limiting factor in infra-sound measurements. 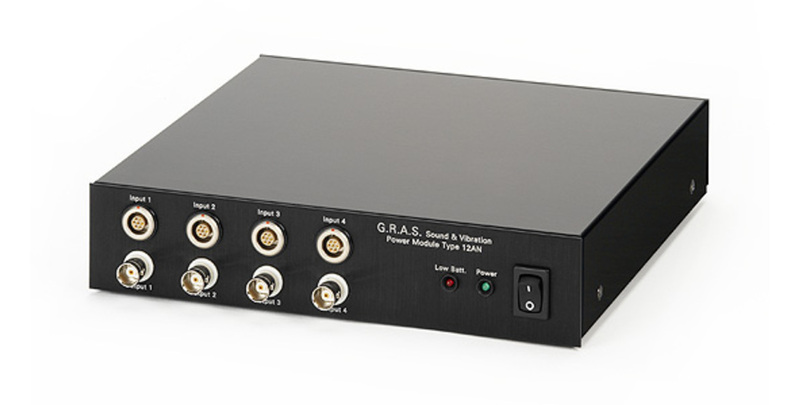 A suitable microphone system for this application is the combination of the GRAS 40AN 1/2" Free-field microphone, low frequencies and the matching preamplifier, the GRAS 26HG 1/4" Preamplifier, High Impedance. The polarization voltage is very stable and the sensitivity of the microphone is therefore kept very stable. For this reason, the 12AN Power Module is well suited for microphone calibration. The 12AN Power Module has four channels for multi-channel measurements and calibration setups requiring more than one channel. You can operate the 12AN Power Module on batteries or an external DC power supply. A battery indicator monitors the battery condition. The 12AN Power Module can be used with all standard, externally polarized microphone sets and standard front ends or data acquisition units. However, when setting up a measurement chain with the 12AN Power Module, you need to ensure proper matching of the components so that signal levels and cable lengths do not interfere with the validity of your measurements. The 12AN Power Module is built into a sturdy, anodized aluminum case and built to high-quality standards which enables GRAS to offer 2 years warranty against defective materials and workmanship. Before leaving the factory, all GRAS products are tested. Should a power module become defective, it can be sent to GRAS for repair.